As my grandmother was famous for saying, "New Year's and St. Patrick's Day are for amateurs." What is it: This is one of my favorite spots year-round, but the Irish pub Fado steps it up on St. Patrick's Day by hosting a day-long street party. They will have Irish dancers, bagpipers and a U2 cover band starting at noon. Buy your tickets here. Betty Tip: Skip the $15 cover and avoid the later (crazy) crowds by showing up before noon and enjoying a full-fledged Irish Breakfast to kick off your day. An Irish Breakfast includes two eggs, Irish sausages, rashers, black and white pudding, mushrooms, tomatoes and pan-fried potato bread. Plus, of course, a pint of your favorite liquid pleasure. It's a stellar way to prep for the day ahead. Check out FAQ about the day, parking and more here. What is it: Located on the rooftop of W Atlanta – Buckhead, Whiskey Blue will have Irish Car Bomb specials, $5 green draft beer, prizes and St. Patrick’s Day inspired bites. Their tagline: Get Bangered ... and Mashed. Ha! Get all the run down on what they have planned here. Betty Tip: First of all, I love this rooftop bar no matter the day, so it's a nice option for what is going to be a really pleasant evening on Saturday. Also, cover for the event, which starts late around 9PM, is only $10 (compared to $15-30 at other spots) and it gets you two raffle tickets, too. Prizes include a one night stay at the W, Gerber Group Gift Cards and MARKET gift certificates. 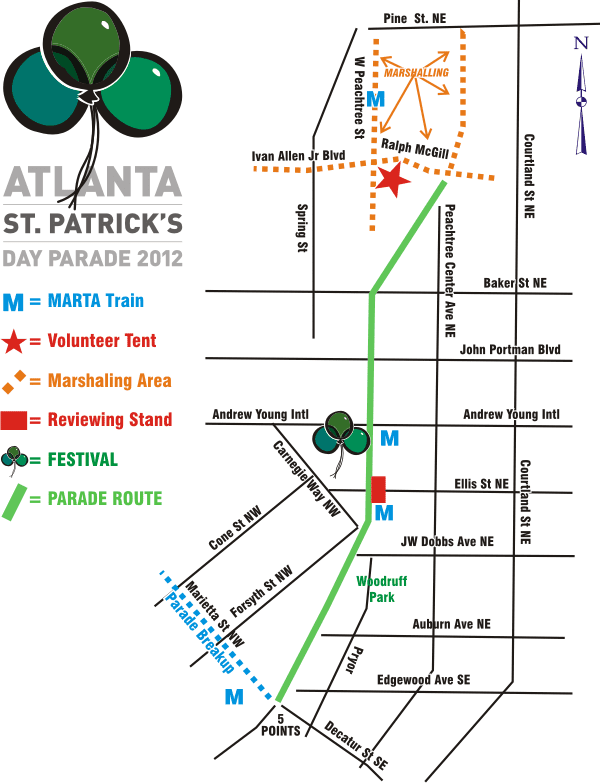 This sounds like it could be a perfect spot to stop by on your way back from the street festival at Fado! What is it: Not feeling the bar scene no matter what? Grab your friends or your kids and head down to see the parade, instead! We might not have a green river, but this parade is sure to entertain. 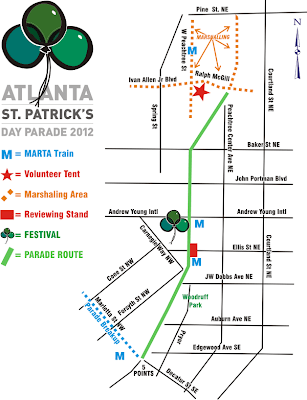 Get more info about the parade, participants and route here.